Directions: From Morehead, follow Flemingsburg Rd./State Rt. 32 West to signal light (just over one mile past the Interstate 64 interchange) at junction with Rt. 377 Cranston Rd. then right 12.1 miles on Rt. 377 (Cranston Road). Barn is at left. 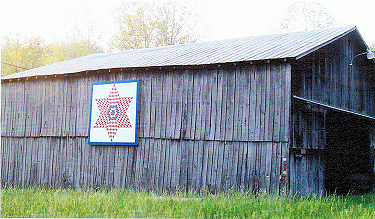 Notes: Design was copied from a quilt owned by the Blythe family.